The Bernina Express is one of the wonders protected by UNESCO as a World Heritage Site. It is close to us, so..TAKE ADVANTAGE!! 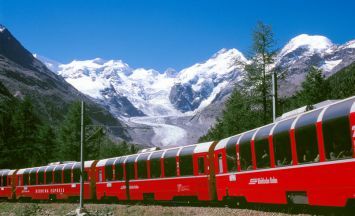 Our hotels near the Bernina Express are the best place to plan calmly your unique experience. Why the rush if you want to fully appreciate the wonders that the path of the Bernina Express has to offer? You should carefully consider where to go to sleep for the Bernina Express, to ensure comfort, service and savings. If on top of that you can enjoy good Valtellina cuisine, even better! So we want to help, by offering you a special package for hotels in Livigno for the "Red Train"
The path that the Bernina Express faces every day of the year is one of the most beautiful train journeys in the world. Along the way the Red Train you will not be bored. From Tirano, with its 400 meters, to the 2200 m of the path located where the Bernina Hospice Refuge resides, moving along rivers and lakes, running alongside the glaciers to finally get to the noble Sankt Moritz. It can a great opportunity for a day trip or a romantic weekend. More than a trip it is an experience, rather than an excursion, a thrill ride. There are many things to do in Alta Valtellina, both in summer and winter: Livigno is a duty-free zone that will be for sure extremely pleasant to do shopping in its duty free stores. Mountain lovers who prefer to hike in nature will have in the Stelvio National Park their ideal destination. Depending on the type of holiday that you want to live, do not hesitate to contact us for any advice and itinerary: we will be happy to plan with you next holiday in Valtellina! The Bernina Express is leaving... all aboard!